Finally after 2 weeks of reviewing Apple has approved the first version of Glocals Mobile for iOS and now it is available on AppStore for downloading. It is FREE for everyone and showing no ads. I want to thank everyone who have helped me testing this app. Special thanks to Denisa H for her findings and detailed comments. 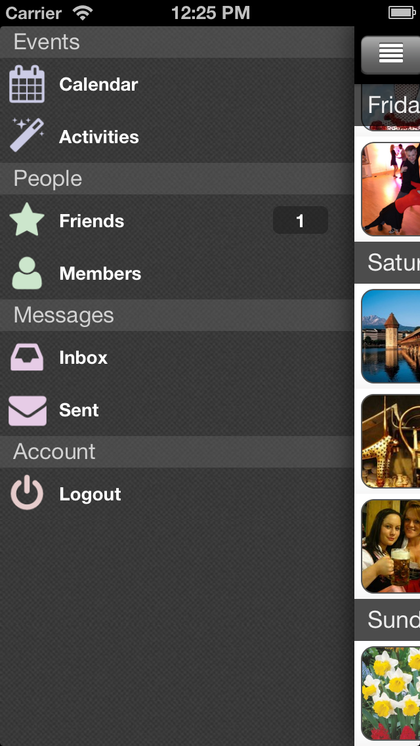 The app is my little commitment to the glocals community. Thanks you all for what you are doing. Thanks, great app. 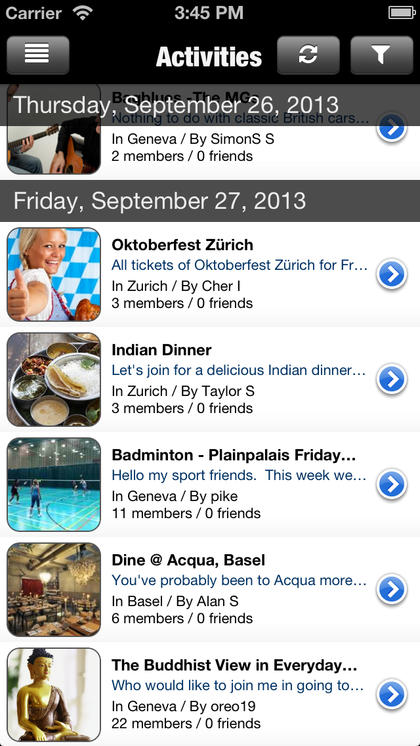 Suggestion for future versions: ability to filter activities by city depending where you are living - eg Geneva only. Just go to activities than tap on the filter button than choose your city. Thanks for the tip, I hadn't seen the filter button. I can't seem to get the selection buttons to work - not sure if it is just my ipad so will also download to the iphone and check it. way to go vitaly! did you reverse engineer this or was it a collaboration with glocals admin? i see it on the top left, looks like an Funnel/antena or , just next ot a like refresh button. then where you see City : All, just place your finger and flick to the left, you will get Geneva, first choice..
Other options is Interval, TYPE, Attendance. Pretty handy! Thanks for sharing. It is a simple reverse engineering. JSON hijacking + a bit screenscraping. It would definitely benefit from some sort of support from the site developers but I didn't ask for it since it sounds quite unbelievable. It is a lot of work to improve the API, IMHO. If this is not approved by the Glocals admin, does this mean when we upload to our iphones, you then can start collecting personal data, save our passwords, etc. I think if you got an ok/go ahead by the Glocals site admins, you will get a huge roleout , or huge banner on the website of this new iphone application, unfortunatly Richdog is right, tha alot people will be disapointed there is no android version. I have used the app and it works quite well. In a future release could you make it so it remebers the filter settings. This would be quite useful. Wow Vitaly! Well done - really. Glocals on ios has been a p.a.i.n.f.u.l. experience for soooo long! This time I am mostly focused on web/android development so I didn't pay for my account on Apple for a while. That's why the app is not available on AppStore any more. I could maybe send you the binaries but I am pretty sure the app needs to be adopted for iOS 7/8 so it will not work just out of the box. thanks for the info. All that hassle would not be necessary if the original website worked with the iOS browser. Is there some "official" glocals API you are using or is your app scraping the information directly from the HTML? The app does some screen scraping but mostly uses reverse engineered ajax calls. The "official" glocals API? That would be a luxury. Even internal API is inconsistent which makes reverse engineering a bit painful. Unfortunately I didn't add anything to gather analytics so I can't say so sure but it seems that the app wasn't actively used. I barely had no feedback at all so I almost forgot about it. That's probably why the glocals owners aren't interested in investing into improving mobile experience. You think IOS dominates the OS market? read on. It looks like the app doesnt exist anymore. Would really be good to have a working app. I'm hardly ever at the computer and it works really bad on my phone browser. Cant even click on the 2nd page of events for example, it doesnt work. Not to mention that all is really small because it is a destop version even on phones.